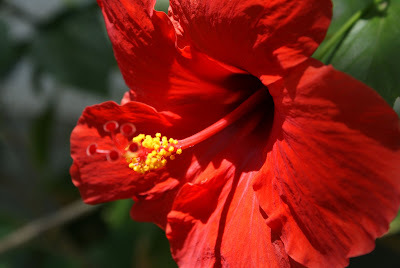 The intense desert heat is pretty hard a many flowering plants, but the hardy hibiscus keeps on blooming. This one is right outside my bedroom window and is still producing blooms every day. While cruising around the various historic districts over the weekend, I came across this snazzy red car belonging to the Phoenix Fire Department. I wonder who gets to drive this sporty car. Do you think this would be more fun to drive than the fire engine? I discovered this magnificent creature in the Encanto Manor historic neighborhood. He is perched on a brick pedestal next to a driveway of a home and his view is of the Encanto Golf Course immediately across the street. This lion looks like he belongs guarding the entrance to a school or art museum or some other large public building. Instead he watches the golfers from the yard of a modest bungalow. The smaller photo is of a home just around the corner from the house with the Lion. The Encanto Manor neighborhood is right next to the Encanto-Palmcroft area that I featured last week. The homes here date from 1945 to 1959. I noticed an interesting trend in the F Q Story Neighborhood. Many of the homes had their chimneys topped with artistically designed chimney caps as shown in the above photo. Also, a large number of the homes had some type of art piece prominently displayed as shown in the smaller photo. Each of the art pieces I saw was done in the same rusty metal but there were a variety of shapes and sizes. All of them looked like they came from the same artist. It makes me wonder if there is an artist in the neighborhood that is greatly admired by those residing in this area. I spent some time over the weekend prowling around another historic neighborhood not too far from where I live. The F Q Story neighborhood is named after Frances Quarles Story who developed many commercial projects as well as this neighborhood. He was apparently a man of many talents because he has been credited with the creation of the advertising campaign that made the Sunkist Orange famous. When this neighborhood began in 1921, the population of Phoenix was only 29,000. Construction continued into the late 1930’s halting when the depression hit Arizona. Homes in this area are built in a variety of styles from Spanish Colonial as pictured above to English Tudor to Craftsman bungalows. The English style bungalow in the smaller photo is vastly different from the Spanish Colonial in the large photo but they are located just a short distance away from each other. They both have very unique charm and appeal. I am NOT a bowler so when I attended a charity bowl-a-thon on Friday I decided to snap a couple of pictures because it will most likely be a very long time before I see the inside of a bowling alley again. I have to admit that the event was great fun and lots of laughs (mostly at my bowling skills). 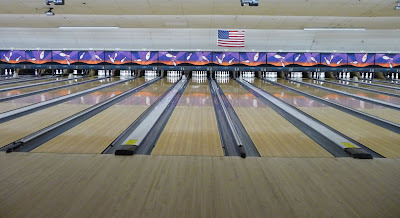 I’m just glad that we weren’t bowling for a prize because I am sure my lack of talent in this area would have throttled any prize winning chances my team would have had. I do have to admit that those brightly colored bowling balls are a lot more fun than the black ones I played with when I was a kid. I found this home in the Del Norte Historic Neighborhood which is south of the Encanto area. I was awe struck by the huge tree in the front yard of this home. The tree trunk is so large it almost completely covers the window of the home right behind it. The Willo district is probably the most well known historic district in Phoenix because of their annual home tour. Other districts also promote home tours, but Willo residents market their tour very well and they have a lot more homes open. There are some very beautiful homes in this neighborhood and it was very difficult to choose just two to show you. I’m sure I’ll come back to this area in the future to show you more of it. After all, it’s just down the street from where I live and I have friends in the neighborhood who have done wonderful work restoring their beautiful homes. The two I selected today both have very distinctive characteristics that seem to set them apart from some of the others in the area. Homes in this area date from 1910 to 1950. I can’t leave the Encanto-Palmcroft area without showing you this Pueblo Style home I found there. I love this style of home and even though the color is a little bright, it seems to fit into the neighborhood perfectly. The smaller photo shows the entrance to another Spanish Style home not far away from the featured home. This one has some beautiful tile work and lovely stained glass. The Encanto Palmcroft area is one of my favorites. There are so many beautiful homes in this area that I found it very hard to choose just one or even two. This stately Spanish style home is one I truly admire. The small photo shows another home in the area that I find interesting. I love the terra cotta cornices along the roof line on the left of the photo. Click on it to enlarge and get a better view. Today’s home is located in the Alvarado Historic District. This area is dotted with stately homes, many on very large lots. If you live in this area, you are within a short walk to both the Phoenix Art Museum and the Heard Museum. This is probably one of the older neighborhoods in Phoenix with homes dating between 1907 and 1933. The first historic neighborhood I am featuring happens to be the one that I live in. This house is about 3 streets away from me and it’s one that I have admired on my many morning walks. I love the landscape of this home and the wonderful shade provided by the surrounding trees. Each of these districts has a name that identifies it in some way. 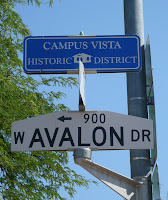 Campus Vista historic district gets its name from the close proximity to Phoenix College. The homes in this area date from 1939 to 1956. The small photo shows the blue street signs that are used to designate a historic district. Each of these neighborhoods is identified by one of these signs situated above the normal street sign. Phoenix has 35 designated residential historic districts. The city protects the integrity of these neighborhoods by reviewing all requests for exterior alterations and additions. There are also financial assistance programs available to help offset the cost of improvements and general maintenance. Rehabilitation training and educational activities are offered by the city’s historic preservation office. Today’s photo is of a working fire station that is located in the Willo Historic District. Each spring, the Willo Historic District sponsors a home tour and a number of the homes are open for the public to tour. This fire station is always open during that event and inside you can see historic photos and a display of fire-fighting tools. This station is the oldest fire station still under the Phoenix Fire Department’s ownership. The small photo shows the sign in front of the station that identifies it. Over the next few days, I’ll show you some of the homes in these historic neighborhoods. I took this photo at Encanto Park. I liked how the lamp post looked like it was as tall as the palm tree. I took this photo over the Encanto Golf Course two weeks ago when we had an early monsoon storm roll in to the valley. We had beautiful clouds, some lightening and thunder, and a little bit of rain. Last night we had another monsoon storm with heavy winds and rain in some areas, but not a drop at my house. Over in Scottsdale they had a lot of rain. For those of you who don’t know the Phoenix area, there is a river that slices through the city cutting us into north and south sections. That river is called The Salt River or Rio Salado and for the most part it is just a dry bed. However, from time to time when we have had an especially wet winter and spring, it can rage out of control and tear things up. It hasn’t done that for many years and engineers and environmentalists have been working hard to keep it that way. The area boasts ten miles of trails for hikers, equestrians, and bikers with staging areas and parking lots to accommodate cars and horse trailers. There are also facilities available where educational programs are presented for school children as well as adults. There are monthly bird walks scheduled and a lot of other activities in the cooler months between October and May. The information I saw said that over 200 species of birds have been identified in the area. I took today’s two photos at one of those recreational areas just under the Central Avenue bridge. My dad used to call this “the back side of water”. It was a little joke he used whenever we were looking through a waterfall. This was taken behind the waterfall at the Arizona Falls Park that I featured back in April. Arizona Falls is a joint project between the city, the Commission on the Arts, and Salt River Project, one of our two main power sources in the Phoenix area. In fact, this waterfall and two others at this same location are producing hydroelectric power that is transferred into the Salt River Project electrical grid. This small station produces enough electricity to power 150 homes. Water is such an important resource for Arizona where much of the state is desert that I’m going to show you another water-related topic tomorrow. 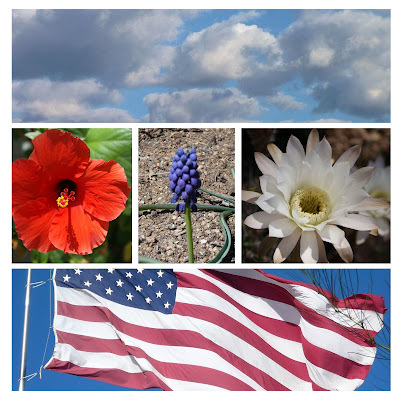 To see what other Arizona bloggers have posted for theme day, click the links below. Self published is more like it. I mentioned a few weeks ago that I was thinking of making a coffee table book of the photos that I took on my nine visits to the Desert Botanical Garden when the Chihuly show was running. Well I did it and I’m very happy with the result. The book is beautiful and will give me lasting memories of the fabulous show. And, it looks great on the coffee table. 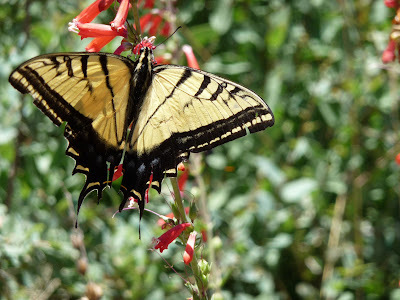 When I saw this butterfly flitting from flower to flower, I grabbed my camera and went in hot pursuit. I think I snapped 20 pictures hoping for just one good one. This was it. My closest friends have two beautiful Golden Retrievers named Jake and Molly. I have the sweet pleasure of Jake and Molly’s company when their owners are out of town. I couldn’t ask for better house guests. They are well behaved and utterly charming. Here they are peeking out the window to see if the car they heard might be someone they know. A year ago today I started the Phoenix Daily Photo blog and here I am 365 photos later still going strong. It has been quite an adventure and I’ve enjoyed all of it. I’ve learned so much about my city and I see my surroundings in a whole new light. Since I started, I’ve upgraded my camera equipment and attended many public events that I’ve always wanted to attend, but never found the time. Today I’ve posted another glass work from the Chihuly: The Nature of Glass exhibit that ran from November through May at the Desert Botanical Gardens. I think of all the events I’ve attended, this one tops the list. I just checked, I visited the gardens 9 times during its 7 month run. What makes this event very special to me is that it taught me that visiting the gardens is not a once a year activity, but something I need to do on a regular basis. The beauty of the desert plant life is to be savored all year long. The Chihuly show was spectacular, but the wildflowers, butterflies, and cactus work their own spectacular magic the year round. Here is a view of downtown Phoenix that I snapped from one of the county high-rise buildings. The building to the left, with the crown on top is the City Hall building that I featured here. The older, low building to the right of the photo is the building that houses the Maricopa County Court House and the old city hall. You can also see a number of business high-rise buildings in the mix. The building under construction to the very far right is part of the Copper Square Project that combines, office space, living space, and retail space in one development. It is one major development project that continues to progress even in these tight financial times. Today I feature St. Thomas Church on north 24th Street in Phoenix. This church was founded in 1950 as the 12th Catholic parish in Phoenix. It wasn’t until 1960 that this Spanish colonial church was completed. Not yet 50 years old! It’s just a baby by world-wide standards. This tiny little eating establishment called Two Hippies Beach House has taken off like a rocket! The lines at lunch time have become notorious. They specialize in tacos of all kinds and those tacos are getting rave reviews from happy customers. It’s only draw-back is that it has no indoor eating facilities. Not a problem October through May, but after that you need to be a hearty desert rat to eat on the patio or you need to make it a take-out meal and head back to the office. Over the past weekend I was sitting at the car wash waiting for my car to be finished when something made me think of that old Jim Croce song “Workin’ At The Car Wash Blues”. The next thing I knew, I was outside snapping a photo for Phoenix Daily Photo. I wonder how many of my readers have ever heard of Jim Croce, an American singer/songwriter who recorded at least 4 albums that soared to the top of music charts in the late 60’s and early 70’s. His skyrocketing career was cut tragically short by a plane crash in September of 1973. I guess it’s not really crystal. Just a decorative ornament that caught my eye. I spotted this building under construction and thought it had some very unique patterns and ornaments. There was no sign to tell me what it is going to be so I’m at a loss to explain. I just thought this design at the top was quite unusual. Today is Independence Day in the U.S. There will be picnics, bar-b-qs, parades, and fireworks. I put together this silly little collage in honor of the day! Here’s wishing a great weekend to everyone! This building is located in an affluent residential neighborhood in Phoenix near 32nd Street and Lincoln Drive. There is a sign in front that identifies it as the Phoenix Monastery, but I can find no record of it anywhere. I’ve searched the web looking for monasteries in Arizona and come up with nothing that matches. If it truly is a religious monastery, it has a lovely location with some spectacular views. All great for heavy meditation. The small photo shows the sign at the end of the driveway. The Miracle Mile Deli has been in business in Arizona since 1949. My very first experience with this deli was when it was located at the Park Central Mall on Central Avenue. That mall has since been converted to a large office complex and the deli has moved a little further east to another mall on Camelback Road. When it was located at Park Central, the lunch-time crowds would fill the little maze-like queue and the servers would be working at warp speed. You had better know what you wanted when it was your turn because they had no tolerance for hem-hawing over the menu. The Miracle Mile Deli was my very first introduction to Pastrami and I fell in love with it. I’ve since traveled to places better known for their delis and I have to say that Miracle Mile can stand up to the best. Now my favorite sandwich is the brisket on an onion roll. With a dab horseradish and some mustard, it’s pure deli-heaven. By the way, I took this photo near closing time. No long lines late at night. I have featured the Herberger Theatre in downtown Phoenix in the past. The building has two stages, the main theatre and Stage West, the smaller theatre. This is a view of the inside of Stage West taken from the stage. Obviously, I took this shot when the theatre was empty of patrons. If you happen to be a performer or a theatre company, you will be hoping to see all those seats filled when the curtain rises. To see how other bloggers have interpreted today’s theme, see the link below.